Christine Collins writes about Potters Bar's comedy winner. It was quite a bombshell for Potters Bar Cine & Video Society when they learnt that their video production Timeline had won a major award for Humour in the IAC's International Film & Video Competition and that it would be screened at the Movie 2002 Festival. It has now been chosen as part of the UK programme for the UNICA Festival 2002. Why is it, you may ask, that we amateurs usually plump for making a comedy? It is a well known fact that comedy is one of the most difficult of styles to achieve. It must be well written, well performed and well timed. Probably many clubs make a comedy because they believe that it will be less embarrassing than a love story or a film on an adult subject. So it was that our club film turned out to be a comedy. "I'm sorry but all our lines are busy at the moment and you are held in a queue!" as well as being in imminent danger of explosion caused by a black cat walking over the bomb or his next door neighbour choosing the wrong time to practice his golf swing! The film was originally made for the IAC North Thames Region Triangle competition, a knockout competition between sets of three clubs showing a programme of three films, a Documentary, an Open and a film made to a Set Theme. The theme being 'Time'. The Potters Bar Cine & Video Society production was the result of a brainstorming session at the club with many ideas being suggested. But it was left to Chairman, John Astin LACI, to gel the ideas together and write, direct and shoot the production. Other members of the society providing lighting, sound and prop skills as well as 4½ stars of the film: Charles Wilkinson who played the hapless gardener, Penny Love LACI, his wife, Heather Hawkes who is the unseen voice of the government answerphone and Fred Musk, his neighbour. Oh, and the half ... well that was Emma the black cat who had to be enticed to stand on the bomb by hiding some prawns (her favourite)! With careful planning the main bulk of the film, both interiors and exteriors, was shot in one day. The 'voice' of the government answerphone was recorded and edited beforehand so that the main actor could react suitably to her various bizarre options ... "If the bomb is red, PRESS 1. If the bomb is silver, PRESS 2 ... If the bomb is grey, PRESS 3" ... and "If the bomb was made in Essen, PRESS 2 etc ..."
causing him to run from phone to garden to look at the bomb until his wife points out that he is using a cordless telephone should take it with him! This proves fatal, as when he does finally contact the department concerned it is not only closed for the day but they offer a list of things NOT to do if you find an unexploded bomb: one of which is to use a cordless phone within close proximity! The camera used was the Mini DV Sony VX1000 with a Sennheiser gun mic on a pole. The answerphone messages had been recorded on the camera and transferred to audio cassette for playback during shooting. The plan was to replace this sound with the original digital recording plus a telephone effect at the edit stage. In the end the 'off camera' answerphone voice was used with some 'doctoring' as there was some overlap of dialogue during shooting and also it became obvious that the clarity of the answerphone message options was essential to the success of the film. The film was edited on Adobe Premier 5.1c with Canopus Raptor. A rough edit of the film was completed and I was given a VHS copy so that I could choose any music required. The music was to underline any comedic points etc. The majority of the music used came from the KPM Music Library. I chose a rendition of 'English Country Garden' for the titles and first scenes of the man digging in the garden. We were able to extend some of the title captions to synchronise with the music. This flexibility is one advantage of editing on a computer based system. Other pieces of music underlined the time passing whilst he wrestles with the 'phone options plus a faster piece when he runs from house to bomb as well as a slightly tense piece for when his neighbour is in danger of sending a golf ball over the fence onto the bomb! The Club is covered by a copyright clearance licence obtained through the IAC. It was also my job to light the interiors. These were lit using two 'redhead' lamps of 800 watts each with 'tracing paper' to soften the light. No blue gel was used as the french windows of the room were never in shot. The exteriors were shot from a variety of angles giving the film interest, some low angle of the gardener's face as he digs up the bomb, long shots to place him in the environment and high angle shots as he runs from the house to the bomb to check on the various options asked of him. Many good close-ups were used throughout the film to point up the story and to add interest.... CU of finger pressing buttons on 'phone ... CU of frustrated face CU of bomb CU of clock with minutes ticking by etc. The 'bomb' was made by one of the team. Inevitably it looked a bit of a 'joke' bomb, but that was all part of the style of the film! The bomb was 'planted' in the garden and the gardener began to dig. As shooting progressed and the action became more frantic, apparently the real neighbours became quite suspicious and worried! The part of the film that took the most time to shoot was the explosion. It was thought that the use of some fireworks would do the trick with the 'bang' being filmed in big close-up and edited in. But this just didn't work at all with pathetic futs coming from the 'bangers'. A crew member volunteered a smoke machine that is used to pacify bees in the hive to create a large amount of smoke. Apart from this taking some time to get going as it has to be filled with dried grass and set light to, it caused the entire crew to suffer from runny eyes and coughing fits! We discovered that in the editing all that is required for an exploding bomb is a straight cut to a lot of smoke synchronised to the sound effect of a large explosion. And so it was that Timeline went out with a bang! 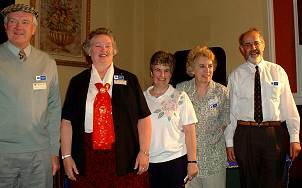 L-R: Charles Wilkinson, Penny Love, Angela Stroud, Christine Collins and Bob Chester. The video was extremely well received when shown at the Movie 2002 Award Winners show in Chesterfield with gales of laughter spreading throughout the audience much to the relief of the members of PBCVS who attended the event. Timeline received the Peter Wilberforce Smith Tankard for humour and a Gold Seal. Potters Bar Cine & Video Society meet on alternate Thursdays at The Wyllotts Centre, Darkes Lane, Potters Bar. Help and friendly advice is always available and visitors are welcome. Ring 01707 656446 for information.